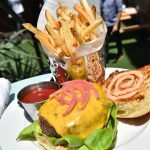 The Freehold Burger is regularly served with rosemary-salted shoestring fries or truffle-parmesan fries. Season Burger with rosemary salt and freshly ground black pepper. Cook to order and melt American cheese on top. 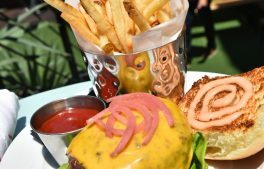 Serve on Balthazar bun with bibb lettuce, pickled onions, and a dollop of Burger sauce. Flash fry rosemary and drain excess oil. Combine with Kosher salt and set aside. In a large mixing bowl, dissolve sugar in Worcestershire sauce with a whisk. After sugar dissolves, add remaining ingredients and whisk until fully combined.